The goal of the tool is to get an understanding of how much code is important to the benchmark: specifically, how many lines of code cover 99% of the execution time of the benchmark. There are many possible statistics that we can gather that would be meaningful, but I chose this one as a rough measure of the amount of hot code in the benchmark. This is an admittedly crude heuristic — it is dependent on the implementation used to run it (Python 2.7.6 for these results), and has all of the flaws that come with using lines-of-code to measure anything. Still, I think it can still be useful as a rough starting point for talking about the sizes of our benchmarks. For reference, my icbd static type inferencer measures in at 1268 lines of code for 99% coverage — it’s a poor benchmark in many ways (non-determinism for one), but this metric suggests that at least along this dimension, it has quite different behavior than the most of the benchmarks in the PyPy benchmark suite. Again, I’m not trying to say that a small benchmark is necessarily bad or that a large benchmark is necessarily good, but just that we may need more variety in our benchmarks to capture the behavior of different types of programs. I’m glad to see that there are some larger benchmarks in the PyPy suite, though I think there’s still some room to improve, since they get outnumbered by the smaller benchmarks (the geometric mean is still quite low). I picked the 20 benchmarks that PyPy lists on the front page of their Speed Center, which are the benchmarks that they seem to base their published numbers on. To try to closely match their environment, I modified the benchmark suite’s “runner.py” to output the commands it runs rather than actually run them; in the previous version of this post I just ran the benchmarks with their default arguments. The PyPy benchmark suite only reports peak performance, and ignores any initialization or warmup time, so I modified the measure_loc tool to ignore those as well. PyPy has a number of benchmarks that they don’t include in their primary benchmark set (the one they use to compare to CPython), but are available in their repository for use. = with a tracing profiler. The translate program isn’t signal-safe or easily made to be so, so I have to run it under a tracing profiler. The tracing profiler is much more invasive and it’s not clear how the numbers compare; they seem to usually be 0-30% higher than the sampling profiler. The tool has been pushed to the Pyston repository, and I’ve tried to make it user-friendly: just run “python measure_loc.py your_script.py your_script_args” or “python measure_loc.py -m your_module your_module_args” and it will spit out some results at the end. I’d be interested to hear what kinds of results people get with other benchmarks or runtimes, and I hope we can start a discussion that leads to some more comprehensive Python benchmarks. A lot has happened for Pyston lately; here’s a brief update. Daniel Agar has taken our hand-written Makefile and converted much of it to CMake. Right now the two build systems live side-by-side, but the plan is (assuming everyone likes it) to switch over entirely to CMake. CMake will hopefully simplify our build process as well as improve our ability to support multiple platforms. Vinzenz Feenstra has contributed pypa, a new parser for Python. A new parser is a sensitive issue, so it’s currently being run as part of our test suite but isn’t turned on by default. If things continue to go well with it, we’ll switch over to it from our current parser. Our existing parser shells out to CPython to do the parsing, which serializes the AST and sends it back to Pyston. Not only is the process inelegant, but it incurs a pretty hefty overhead per file or expression we want to evaluate. The new parser should help a lot, and also looks well-factored so it should be possible to use in other projects as well. Marius Wachtler has written an AST interpreter for us, which has now replaced our old LLVM interpreter. 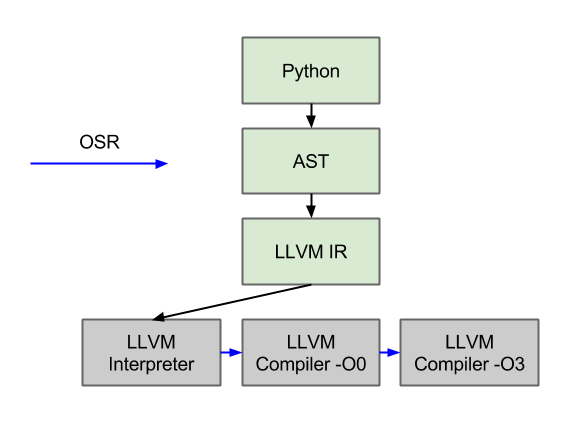 Our old tiering process was to convert all Python into LLVM IR, and then run that IR through various LLVM tiers (interpreter, -O0 compiler, -O3 compiler). This worked fine, except that the main overhead in this process was converting the Python AST to LLVM IR. With the AST interpreter, we can avoid this expensive process for the majority of our code. The other selling point of the AST interpreter is that it will allow us to build “resume-at-any-point” functionality, which we need for our new tiering framework, which will in turn allow more aggressive speculations and optimizations. Currently, though, the new AST interpreter is slower to execute than the LLVM interpreter — which was surprising to me, since the LLVM IR is quite low level and not designed for interpretation. 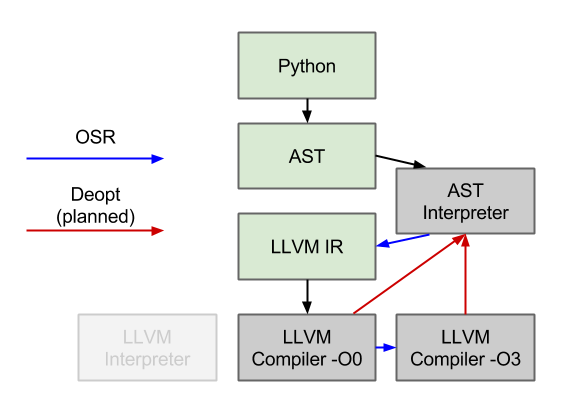 The LLVM interpreter does have a few advantages, though: 1) it happens after (very simple) type specialization, which means that it is able to elide dynamic dispatches, and 2) the pointer-based SSA in the LLVM IR is faster to manipulate than the string-based Python AST. Thankfully, the AST interpreter is significantly faster to start up, as we hoped. Unfortunately though, for one of the cases we were hoping to improve (sre_parse._parse), the function ends up being hot enough to escape the interpreter and incur the compilation cost. As future work, we need to improve the performance of the interpreter so that we can keep more code in it, and also lower the overhead of our compilation tier. Be able to run them quickly. On the compatibility side, we need to support one more language construct (exec) and a number of additional extension modules. On the performance front, there are two main things we’re focusing on. The first is reducing our startup time, much of which comes currently from sre_parse._parse (via “import optparse”). The AST interpreter is key to this, as well as some other things we’re going to work on such as swapping the LLVM register allocator. The other performance aspect we’re working on is better speculations. We have all the parts we need now (AST interpreter and frame introspection) so we have started working on a new tiering framework that will let us speculate on events such as integer non-overflow. Unrelated to any benchmarks, we are also trying to get Pyston running on OSX. We have a branch that builds, runs through startup, and then segfaults somewhere. I’m currently working on getting a working debugger on OSX to continue the porting. So, things are still moving quickly, but there’s still a lot to do! I’ve kept the Github issues list up to date with available projects and tasks, and I created a new tracker task that lists the various benchmarks that we don’t support yet as well as what we need to get them running. Please feel free to dive into any of them or to send an email to pyston-dev@pyston.org with any questions. In interpreters, it can be relatively easy to support frame introspection since you will typically have a runtime structure that corresponds to all of local variables that are defined — this is how our interpreter tier works and adding frame introspection there wasn’t that difficult. For our compiled tier, we don’t have any such runtime structure: all the Python locals get converted to C-style locals and end up in registers or spilled onto the stack. We want to be able to locate all of our variables without affecting runtime performance or code generation, and to achieve this we used some new features of LLVM. Pyston makes extensive use of LLVM’s new “patchpoint” intrinsic. If you’re curious, the documentation does a very good job of explaining what they are, but in short they provide two separate but related features: the ability to runtime-patch your generated code (which we use for inline caches), and the ability to receive the locations of runtime values as determined by the LLVM code generator, via “stackmaps”. We were already making extensive use of the first feature to do runtime code patching for various purposes (a future blog post, perhaps), and now we started using the stackmap feature. Our approach is pretty straightforward: for every callsite that might ever need frame introspection — which is essentially all of them — we attach all the local variables as stackmap arguments, and LLVM will generate a stackmap that tells us where those variables live during that callsite. Then at runtime, we interpret the stackmap and locate the variables. As you can guess, the practice was slightly harder than the theory. While patchpoints have been quite robust for us in their common use, using them for all callsites exposed a number of bugs or missing features in LLVM’s implementation. The first is that they did not support LLVM’s exception handling mechanisms, which we use to for Python-level exceptions — we added this and it is now in LLVM trunk. We also had to add support for returning doubles from patchpoints (patch pending) and ran into an issue where we can’t use LLVM’s “i1” type to represent booleans for now. There are also some issues where LLVM will tell us that a value exists in a caller-save register, which we will have to save ourselves since they will get clobbered; there’s an ongoing discussion about how to resolve that. To fix this, we now clear out temporary variables within a basic block. It means that we have to do slightly more work during the analysis phase, but the result is that there is practically no increase in runtime cost from turning on frame introspection and the associated extra LLVM IR. In addition to features that we want to build on top of this, there are a number of related optimizations we can do. For example, LLVM currently generates a separate stackmap per callsite, but for our uses, there is a fair amount of overlap between the different generated stackmaps (a spilled register will stay in the same stack slot), so we can store these more efficiently by doing some simple compression of the stackmaps. Our frame introspection also invalidates a number of optimizations that we used to do, since to the optimizer, every value will tend to immediately escape. In the long run, this is something that we need to have, and it enables more optimizations than it breaks so we are excited to have it. LLVM already has an established mechanism for transmitting the locations of user source variables: this is something that any debugger will want of any language. LLVM has a series of intrinsics that can encode this information, which flow through the code generator and end up being emitted as DWARF, the standard debug info format that (for example) GDB will read. At first, it seems like a natural fit — we’re trying to do exactly what debug info is meant to do. LLVM has pretty good support for debug info (as good as clang’s is), and it solves a number of problems for us such as the efficient encoding of variable locations in addition to hooking us into a widely used standard. We tried going down that road with little success. The problem is that Python has the requirement that all variables are always available through frame introspection. If you’ve ever used GDB on an optimized program and seen something like “(value optimized out)”, you know that normal C/C++ debugging systems don’t guarantee this. The problem is that guaranteed debug info can inhibit optimizations or cause extra work, and a very reasonable requirement of debug info is that the debug-enabled version has exactly the same code as the non-debug version. So LLVM does enforce a strict requirement, but unfortunately one that is opposite from our needs: they guarantee that they will not do any extra work to make your debug info available. Darnit. One unfortunate conclusion of “not being able to use a non-pessimizing debug info scheme” is that our patchpoint approach does in fact hurt optimizations — by attaching the local variables to all callsites, we force variables to be live and computations to happen at certain points. For instance, most static compilers for languages like C/C++ will optimize away dead definitions like “x = 7”, since there is no way to observe that they occurred. In Python, unfortunately, a dead definition is observable since one can simply look at the locals and see it; in our approach, this translates to LLVM seeing that the variable being referenced by a patchpoint. There are a number of ways we can reduce this penalty, such as by “materializing” the values at the time of frame introspection instead of constructing them eagerly at runtime. We’ll keep an eye on this behavior and see how much such optimizations are necessary; my guess is that relatively little time is spent executing trivially-dead statements. We’re very excited to announce the release of Pyston 0.2, the latest version of Dropbox’s high-performance Python implementation, which contains substantial improvements over the initial 0.1 version. Version 0.2, while still very much a work in progress, sports much-improved language compatibility, and is able to run many of the standard libraries — and some standard extension modules — without modifications. We are particularly excited about the native C API support: the implementation is a work in progress, but we are able to natively provide a subset of the CPython API and run existing extension modules with a recompile. Among other techniques, we disable all refcounting operations, and use our conservative GC to handle the memory management. We currently use a GIL to protect threaded code. While inelegant, it is simple and efficient when there is only a single thread. We have an experimental configuration option to use a read-write-lock variant, which “removes the GIL” and allows multiple threads to use multiple cores, but the potential parallelism is highly limited by the semantics of the C API. There are still many features missing (such as finalizers, unicode, and C API exceptions), but we are at the point that we can run a number of completely unmodified benchmarks from the PyPy benchmark suite. The benchmarks we run are themselves simple, but they use a harness that uses the optparse standard library, which in turn pulls in numerous other libraries including the entire regex system. For example, the chaos.py benchmark is under 300 lines itself, but ends up running over 3k non-whitespace Python lines of code and requires the operation of over 10k lines of extension code. Our strategy has been to first validate the overall JIT architecture (v0.1), then to improve language compatibility (v0.2), and is now to focus on improving performance (v0.3). The 0.1 release demonstrated that we have the ability to produce high performance code using LLVM, but running real benchmarks has shown that our performance is currently hamstrung by our simple garbage collector and naive SSA-transform implementation. In the coming months, we’ll be making improvements to these areas, and adding a new tiering framework to enable more advanced type speculation as well as support Python’s advanced frame introspection features. Despite the improvements we’ve made, Pyston is still early in its life, and should be considered in early alpha. It is still easy to crash Pyston (hopefully with an informative error message), and there are a number of known memory leaks. Although we’ve made progress in the past five months, full language and builtin-types compatibility is a target that can only be approached and never 100% reached, and will be something we will have to continue working on. We couldn’t have reached this state without the numerous open source contributions we’ve received: the 0.2 release includes non-documentation commits from 10 non-Dropbox-employees, and we would like to thank all of them for their contributions! We still have a long way to go, and the repository remains open. If building a high-performance Python JIT interests you, please feel free to browse the codebase or email our mailing-list.